Railpictures.ca - Dave Burroughs Photo: I always thought that the water tank at Guelph Jct would make a good picture but it would need a locomotive in the shot to make it interesting. Well, after many trips to the Junction, it finally happened. Built in 1957, CP MLW S-3 6586 did the honours for me. From what I remember, the water tank was located on the north side of the yard and toward the west end. | Railpictures.ca – Canadian Railway Photography – photographie ferroviaire Canadienne. 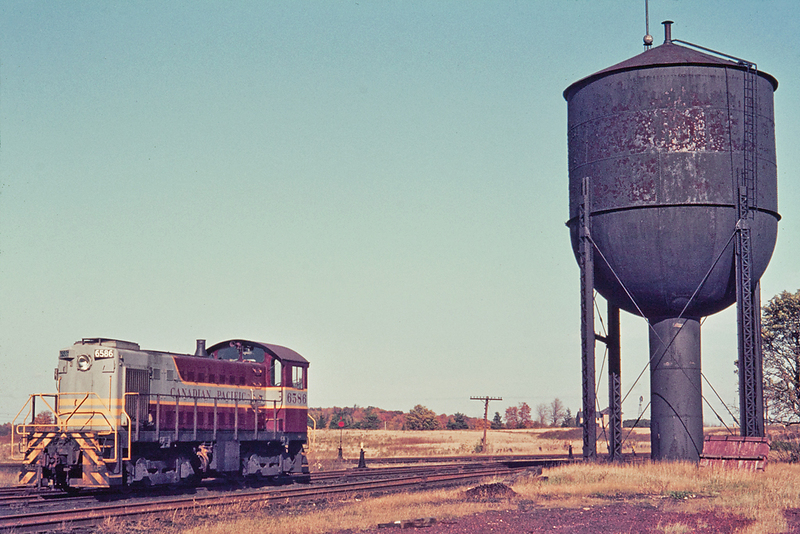 Caption: I always thought that the water tank at Guelph Jct would make a good picture but it would need a locomotive in the shot to make it interesting. Well, after many trips to the Junction, it finally happened. Built in 1957, CP MLW S-3 6586 did the honours for me. From what I remember, the water tank was located on the north side of the yard and toward the west end. Thanks for sharing and great composition. Yes, I think so. Near where the OSR shop building is now but a little south toward the main.